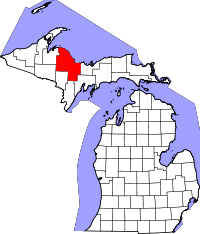 Marquette County, not only the largest county in Michigan as far as actual size, but also the most populated in the northern half of the state, has two branches where researchers can go to view and obtain vital records. The main location is in the Courthouse Annex on 234 W. Baraga Ave in the town of Marquette, and the second is the Ishpeming Service Center, located at 215 W. Hematite Dr., in Ishpeming. To call the Service Center, dial (906)486-6510. The County website links to the Request for Vital Records Form which can be taken to either office in person, or mailed in along with $10 for the initial copy of a record, and $5 for extra copies of the same one. Marriage records are available from 1850 to the present, however information on records from 1882 to 1892 is stored in indexes only due to the physical records having been destroyed during a fire.